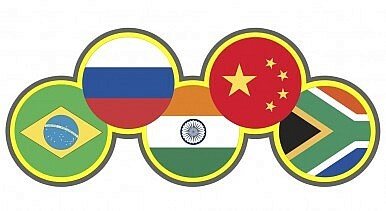 Chinese media argues that the BRICS grouping is still relevant and growing in importance. As leaders from Brazil, Russia, India, China, and South Africa gather in Fortaleza, analysts around the world are taking aim at the BRICS grouping. China’s media, aware of the attention, is offering a spirited defense of BRICS’ relevance that also reveals China’s substantial ambitions for the group. Ever since the BRICS countries began a formal political dialogue, turning a term coined by a Goldman Sachs analyst into a reality, commentators have been questioning whether the grouping is merely for show. Analysts have pointed out the divergent interests of the five BRICS countries, suggesting that they will never be able to work together as a bloc. More recently, hints of economic slowdowns among the BRICS have caused some to dismiss the grouping (which was originally based on economic prowess) altogether. China seems especially sensitive to claims that the BRICS economies are weak, in part because its own economic woes are a major data point driving this argument. “Such claims are totally unfounded and are a serious misjudgment of world economic development,” Xinhua proclaimed. Experts interviewed for that article pointed out that, even with slowing growth, the BRICS economies were still expanding at twice the rate of developed economies. China has defended its own economy with similar arguments, also saying that any slowdown is an intentional trade-off made to achieve long-term economic stability. Expectations of economic difficulties were dismissed as Western prejudice against developing countries. After defending the economic soundness of the BRICS, Chinese media outlets moved on to argue that BRICS solidarity is far greater than Western analysts are willing to believe. Xinhua highlighted the economic compatibility of the BRICS economies, and noted that there was ample room for cooperation between them. Xinhua also emphasized the “political unity behind BRICS’ economic cooperation.” The article noted that the BRICS countries are united in their desire to make more room for the developing world in the international order, from seeking a larger role in global governance to trying to phase out the use of the dollar as the default currency for international transactions. Xinhua argued that the West downplays the importance of BRICS cooperation merely because the developed world is reluctant to accept such a powerful challenge to its dominance. Xi Jinping also had an optimistic outlook for the BRICS in a written interview he gave to South American media outlets. Xi spoke of “growing political mutual trust, expanding practical cooperation in economy, finance, trade, development and many other areas as well as increasing communication and coordination on important international affairs” among the BRICS members. It’s evident that Xi and China envision a major international role for BRICS as a group. Yet there’s also an ambivalence towards taking up this leadership role, in part because China recognizes that concerns about its dominance are one factor hindering closer political cooperation among the BRICS countries. Xinhua was quick to say that China is not “destined to dominate” the group, but at the same time acknowledged that “asymmetries” have developed as China’s economic development has already surpassed that of its supposed equals. As much as China might want to embrace a leadership role in the BRICS group (as it has in other multilateral groups, from the Shanghai Cooperation Organization to CICA), BRICS was conceived as a grouping of equal partners. Straying too far from that paradigm will not be palatable for the other members. Luckily for China, the other BRICS members share its ultimate vision of creating an alternative to the Western-dominated financial and political systems. To achieve this goal, Xi wrote, “We should have full confidence in the solidarity and mutual trust among the BRICS countries and in the prospect of BRICS.” China certainly wants to convey such “full confidence,” especially as an antidote to Western speculation about the fracturing or failing of BRICS. The on-going BRICS summit in Fortaleza, where a new development bank is expected to be unveiled, will be an important test of political unity for the group. India and China will need to work together to increase their roles in the international system. South Africa Prevents Dalai Lama From Attending Nobel Peace SummitThe Promise and Peril of China-India TiesFirst Xi-Modi Meeting Sets Tone for China-India RelationsWill Xi Jinping Visit North Korea This Year?Are the European Union and China Systemic Rivals?